I am not going to rehash the full theory of PLL’s here, there are plenty of places on the net which does that much more competently that I could ever do. Most of them fail to tell you that a PLL is just a PI control loop with phase errors for input and frequency ajustments for output. If you look up PI control loops, you will find entirely different explanations. The only magic there is in a PLL, is picking the right I and P for the poll_interval. Before we continue, lets try to get a feel for what these three parameters do. 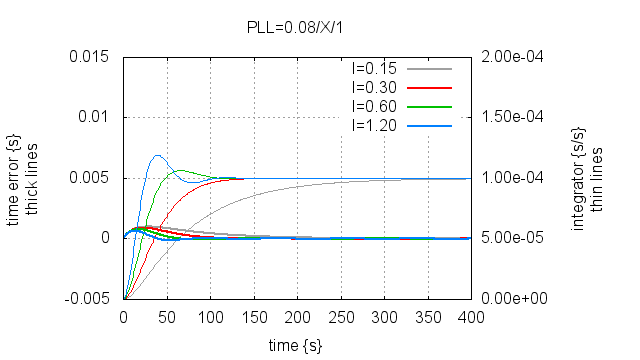 In the next three plots, the simulated local clock is 100 PPM wrong, and the clock has no offset when the simulation starts. The longer the poll interval, the longer before the integrator matches the frequency error. Notice that the worst case time error also increases with longer poll interval. This is not too different from changing the poll interval, which is a consequence of the I(ntegral) term being defined from the P(proportional) term. Without this coupling, the PLL may oscillate rather than converge. If we use a larger I term, we find the frequency faster, but this increased sensistivity also causes “overshoot” or “ringing”. In these three examples, we used perfect phase error measurements with no noise. In practice there is noise, and if the PLL is tuned so it overshoots, this can cause instability. 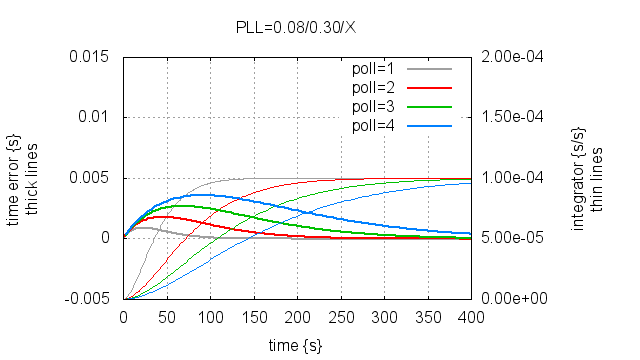 If P, I and poll_interval can be chosen freely, the only limiting factor on PLL performance is the noise in the phase error measurements. If you want to play around with this yourself, I have included below the 111 lines of python source-code which generated these three plots. In an NTP context, the phase error measurement is the big problem, but it is not the only problem. 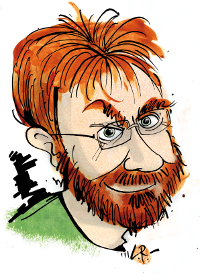 NTP servers are a finite resource, so we simply cannot have every client poll its servers once per second. Historically once ever 64 seconds is the maximum rate, and once per 1024 seconds is desirable. But we also want clients to get “on time” really fast after startup, we don’t want to wait hours or for that matter minutes before our application can trust the timestamps from the kernel. This calls for non-constant P, I and poll_interval, and this is where PLL design starts to get tricky. 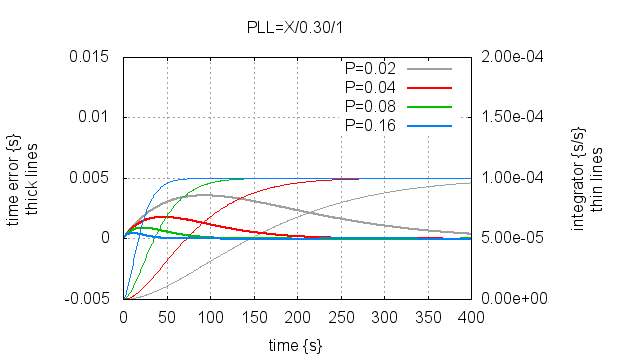 Ideally our PLL will measure/estimate the noise on the phase error measurements, which is more or less the RTT to the server, and tune itself accordingly for the optimal startup performance, then once the local frequency error has been estimated, it will estimate the stability of the local timebase as measured against the servers presumably perfect timekeeping, and tune the PLL for the optimal long term timekeeping.